Arsenic is a semi-metallic chemical element that occurs naturally in rocks, soil, water, air, plants and animals and is widely distributed in nature in very low concentrations, including trace amounts in everyday foods like chicken, fish, rice and beans. Although arsenic is toxic in its basic form, this toxicity depends on the quantity, form of presentation and exposure time of the element. Health and environmental agencies have done extensive research to establish acceptable lifetime exposure levels without appreciable risk. Arsenic can be found in both organic and inorganic forms and is not necessarily found in the environment unless it has been mobilized, which requires specific physical and chemical conditions. These physical and chemical conditions may occur naturally or be produced by various human activities. Organic arsenic compounds, which are formed when arsenic combines with carbon, are less harmful to health and are rapidly eliminated by the body. Examples where organic arsenic is found include fish and shellfish. Inorganic arsenic, formed when arsenic combines with elements such as oxygen, chlorine and sulfur, can be acutely toxic, particularly when it can be dissolved in water. Inorganic arsenic is present in more than 200 types of minerals and is most common in arsenopyrite, an iron arsenic sulfide. It can be found in soil, sediment and groundwater. 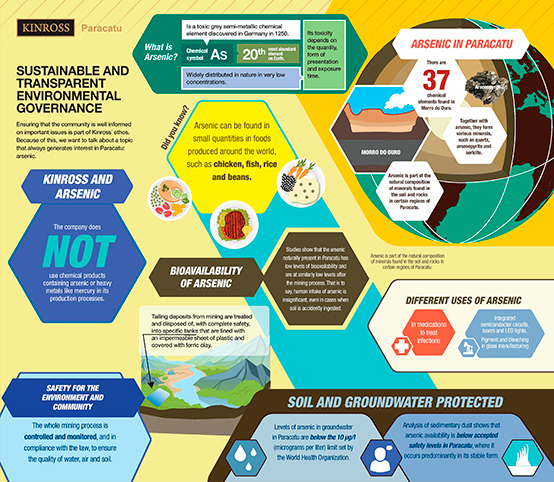 In the case of Paracatu, arsenic is part of the natural composition of minerals found in the soils, sediments and mineralogy of the rocks that contain minerals such as arsenopyrite found in the geological formation of Morro do Ouro, where Kinross operates. There are thirty-seven chemical elements found in Morro do Ouro, including arsenic that when combined, form various minerals, such as quartz, arsenopyrite and sericite. The results of extensive scientific research involving years of data sampling by leading arsenic experts and diagnostic specialists in Brazil and abroad have found environmental exposure to arsenic in Paracatu to be low, with no evidence of adverse health effects related to arsenic. Kinross’ mining activities are considered to be a very minor contributor to overall arsenic exposure. People everywhere are exposed to trace amounts of arsenic every day. It is found naturally in the earth’s crust, in our water, in the air we breathe and in many of the foods we consume. • Dermal from dust, soil or water, although this is usually considered to be of less importance in the case of arsenic exposure. Health risks associated with arsenic are affected by a number of factors, including its chemical form (organic or inorganic), its solubility (ability to dissolve), and to what degree it can be absorbed by the human body (bioavailability). The benchmark reference level set by the World Health Organization (WHO) for total daily arsenic intake is 3 µg/kg/day, based on a 70 kg adult or 210 micrograms a day (it can vary between 20 and 300 µg/day). For example if rice contains 210 µg/kg of inorganic arsenic then a 70 kg adult would have to eat 1 kg of rice (dry weight) to reach the benchmark dose. This is equivalent to consuming 12 daily servings of rice (160 grams of cooked rice per serving) over the course of one’s life. Seafood also have naturally high levels of arsenic, in this case in organic form and with low toxicity, but it can be detected in urine exams. Drinking-water poses the greatest threat to public health from arsenic. The World Health Organisation (WHO) recommends a drinking water standard for arsenic at 10 µg/L (micrograms per litre). Even at this level, human health effects are considered unlikely. According to the WHO, the daily intake of arsenic from food and beverages is normally between 20 and 300 µg/day. These figures can vary, depending on the normal dietary intake of arsenic, as foods such as rice and seafood have naturally high levels of arsenic. Recent arsenic exposure is most effectively measured through urine samples, with the various screening levels depending on the agency and the country. Normal urine output, according to the Mayo Medical Laboratories (in Rochester) is 35µg of arsenic per gram of creatinine (µg/gC) in urine. Brazilian regulation states that workers who are exposed to arsenic are not considered to be at risk at levels of less than 50 µg/gC. The average daily intake of arsenic in Paracatu is well below the benchmark dose. According to a recent study by leading arsenic researchers from the Federal University of Minas Gerais and the University of Queensland, daily intake is calculated at 0.3 μg/kg b.w. day (micrograms per kilogram of body weight per day) or less than 10% of the WHO benchmark dose. Kinross voluntarily tests its workforce, of which an average of 700-900 employees provide urine samples annually. Over a 7,000 tests were conducted between 2012 and 2016. The average result was 7.2 µg/gC which is considered to be at the low end of safe exposure levels, while about 98.5% fell within the 0-25 µg/gC range and ZERO over 50 µg/gC.